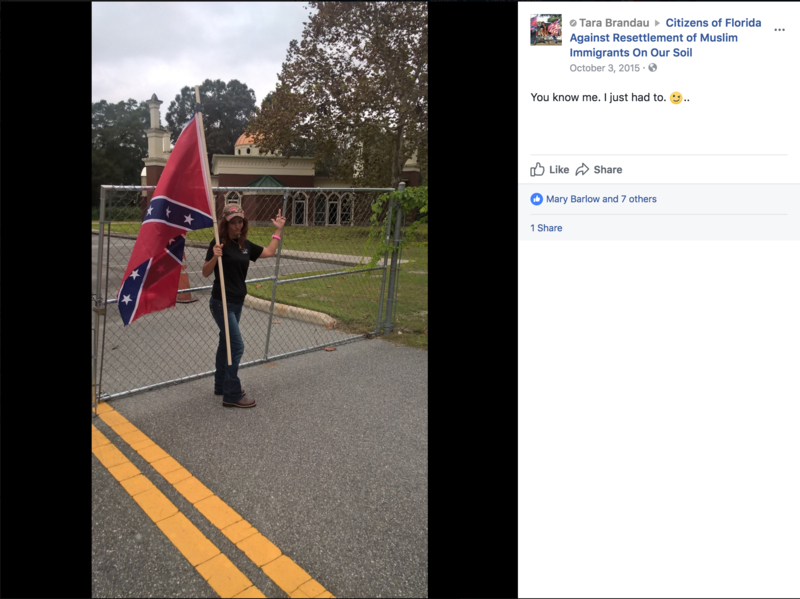 Tara “Hoggirl” Brandau, formerly Tara Turner, live-streamed her small group, composed of individuals affiliated with the Georgia III% Security Force and “CSA II: The New Confederate States of America,” fleeing the scene of their ‘Heritage Not Hate’ rally in a pickup truck, claiming that an unseen group of “antifa,” or “antifascists” had slashed two of the vehicle’s tires. While Brandau’s assertion — that counter-protesters who opposed her planned “Heritage Not Hate” rally are all part of a shadowy far left street gang — bears all the hallmarks of reactionary paranoia typically trafficked by the racist right, she found little sympathy from many in the movement. Florida 3% Sec Force have to be the most pathetic group I've seen. They show up in LARP ... and when it gets scary they run. 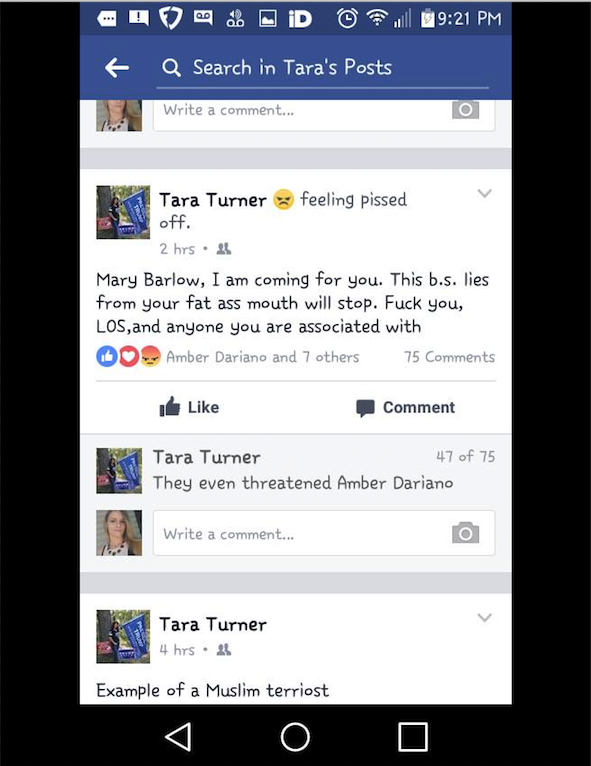 Tara Brandau aka Hoggirl which fancies herself as the commander for that org literally ran away from two fem males on bikes ... and now they are begging for money. What an embarrassment. These are nothing more than yella-belly flaggers. If they run from queers on bicycles ... can u imagine how'd they cave when shtf.. pathetic! Not long ago, Brandau was close friends with some of her greatest detractors. 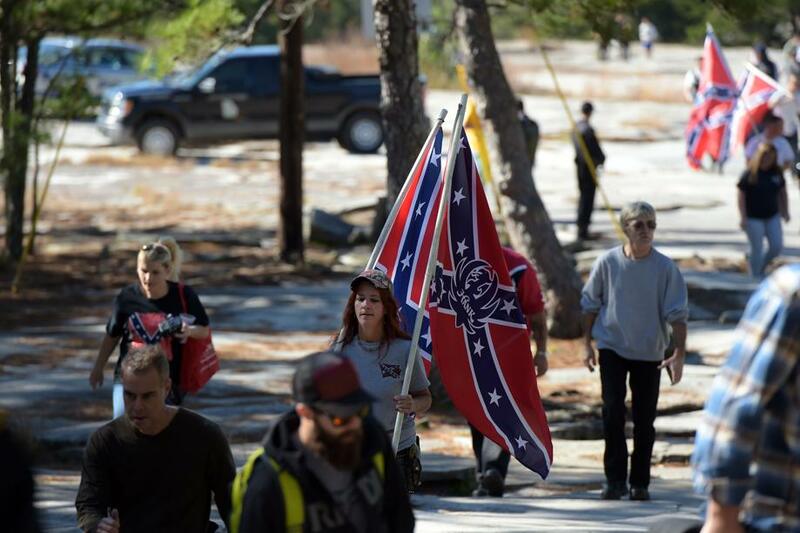 Mary Barlow, a FL LOS member residing in Lake City, Florida, touted Brandau’s participation at the November 2015 Stone Mountain CSA II: The New Confederate States of America rally. Tara Brandau at a CSA II: The New Confederate States of America rally in Stone Mountain, Georgia. Photo courtesy of the Atlanta Journal-Constitution. Barlow was recruited into the Florida League in 2015 and began to almost immediately sow dissent in her Lake City LOS group. Hatewatch has previously documented a running feud between Barlow, her husband and other LOS members. The animosity between Brandau and the Florida League appears to date back to the immediate aftermath of that rally, when Brandau split with her former friend, Barlow, over Barlow’s association with the League, which Brandau decried as racist. Brandau consistently maintained that her participation in a rally at a site notoriously favored by the Ku Klux Klan was not racist. She said she was there to oppose “Black Lives Matters,” the misconception that the Confederate battle flag “stands for hate,” and the inclusion of a memorial to Martin Luther King, Jr., on the grounds of a park that contains a giant stone relief of Confederate icons on horseback. Barlow and Brandau had previously worked together as members of the Florida chapter of “Save Our Southern Heritage” (SOSH), a Confederate “heritage” organization that countersignals the League’s openly vehement racism and acknowledgement that the battle flag represents a white supremacist insurrectionist movement. Since her separation from Barlow and subsequent efforts to distance herself from the League of the South, Brandau has apparently drifted toward “Patriot” and “III%er” groups like III% Security Force and American Warrior Revolution, which have feuded with the LOS, previously. Tara Brandau’s move toward the III% Security Force, which uses an American and Confederate battle flag combined along a diagonal axis, seems fitting for a vocal proponent of the “Rainbow Confederate” notion of a non-racist, ethnically cosmopolitan Confederate army. The feud between Brandau and Barlow, now writ large across the Florida neo-Confederate and Patriot movements, was brewing long before attempts to “Unite the Right” ended disastrously in Charlottesville, Virginia last month. Brandau’s attempt to parlay the tragedy in Charlottesville into media attention for her new organization and the mockery she experienced from her right flank shows just how contentious the symbols of slavery in the South remain, even among those who work to ensure that those symbols are perpetually enshrined in the public square. Editor's Note: A previous version of this article incorrectly identified the rally Tara Brandau attended as having been organized by the KKK. In fact, this rally was organized by her group, CSA II.